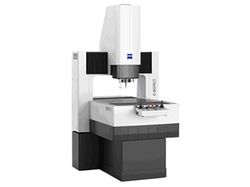 Pioneers in the industry, we offer zeiss - contura g2 cmm- measuring range dm up to 12/24/10 e0 from 1.5 um, zeiss mmz m - bridge-type cmm for complex workpieces, zeiss-o-inspect 543 - multisensor measuring machines, zeiss-o-inspect 863 - multisensor measuring machines, zeiss - rondcom touch - form testers and spindle and zeiss - rondcom 65 b - rondcom 73 a - rondcom 76 a from India. The bridge is subjected to dynamic forces that can affect accuracy, particularly while scanning. ZEISS CONTURA calculates the compensation for such inertia effects. This ensures that the required precision remains intact even at high measuring speeds.Convenient controlThe system is controlled via a userfriendly control panel and does not need a computer. The progressive joystick enables easier and more precise control of all axis movements. The speed can be regulated in CNC mode. RDSCombined with the VAST XXT sensor from ZEISS, the flexible, RDS articulating probe holder enables the scanning of features in all angular positions. With a total of 20,736 positions at 2.5° increments, RDS can reach virtually any spatial angle. This is particularly advantageous for the measurement of complex parts, for which specific stylus configurations have to be created. Calibration times are kept to a minimum thanks to optimal calibration routines. RDS also enables the use of optical sensors from ZEISS on ZEISS CONTURA. 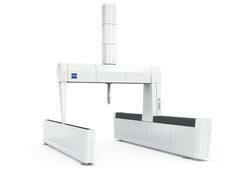 AktivZEISS CONTURA aktiv comes standard with navigator technology for fast scanning in one smooth run. 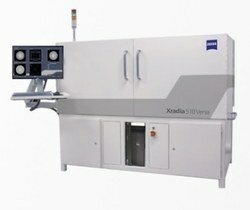 It can be operated with the VAST XTR gold or VAST XT gold active scanning probes from ZEISS – and is particularly wellsuited for the measurement of deep and offset features with high throughput rates. Both sensors use the same receptacle. Existing measuring programs can be used following conversion. The QuickChange fast stylus change-out system is also an option. 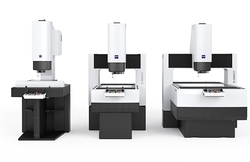 ZEISS MMZ M Bridge-Type CMM for Complex WorkpiecesPrecise measurements at favorable acquisition costs – this was the goal when developing the ZEISS MMZ M. The coordinate measuring machine is ideal for checking complex workpieces, especially those with tight tolerances. Large visual field, high image definition – zoom lens ZEISS DiscoveryZEISS Discovery.V12 comes from the ZEISS Microscopy division. Compared to standard lenses, it provides a 4x larger visual field and very good image definition also in the peripheral zones.The result: reduced measuring time and excellent accuracy. More measured points, more information – scanning sensor ZEISS VAST XXTWith the ZEISS VAST XXT, O-INSPECT is equipped with a flexible, fast and highly precise contact sensor. This scanning sensor captures a considerable number of points in a single pass to enable informative statements on form and location. A speciality in this machine class. ZEISS O-INSPECT allows scans with probing forces in the millinewton range in areas where other multisensor measuring machines only permit single-point measurements with relatively high probing forces. This enables true 3D measurements of thin-walled parts. Quickly and precisely. Seeing and understanding – with ZEISS CALYPSOTogether with ZEISS CALYPSO, ZEISS O-INSPECT opens up entirely new dimensions of visualization. You see the actual status, nominal display and deviations simultaneously, making it particularly easy to properly allocate and interpret the measuring results. ZEISS Discovery.V12 comes from the ZEISS Microscopy division. Compared to standard lenses, it provides a 4x larger visual field and very good image definition also in the peripheral zones.The result: reduced measuring time and excellent accuracy. * Ultra-precision, high throughput and long-term stability. 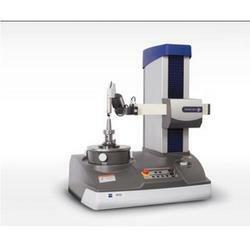 * Spindle form tester for heavy workpieces. * Spindle form tester for heavy workpieces with increased accuracy.Using granite for the base, columns and the R axis makes the machine durable and stable. 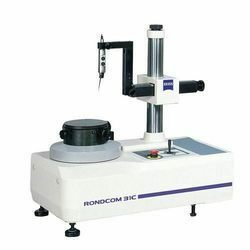 The RONDCOM 65 B features an incremental glass scale in the R axial direction, and the thermal and vibration insulated table ensures excellent measuring stability. 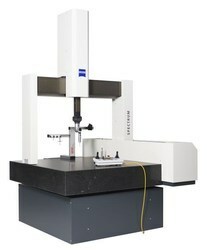 * Table is thermally insulated and actively insulated against vibrations, ensuring excellent measurement stability* Large deflection range of ± 1,000 µm and a high-resolution IMR sensor of 2 nanometers* IMR sensor with safety function in all orientations for maximum protection of the stylus* Incremental glass scale for highly accurate measurements in the R axial directionThe RONDCOM 65 B is a universal form tester for the analysis of roughness, cylinder form, perpendicularity, parallelism, straightness, flatness, coaxiality, concentricity, thickness error and radial runout. With a rotational error of just 10 nanometers, the RONDCOM 65 B is ideal for a wide range of precision parts with a maximum diameter of 420 mm and weighing up to 60 kg.RONDCOM 73 AThe working range of the RONDCOM 73 A is exactly where other form testers reach their limits. 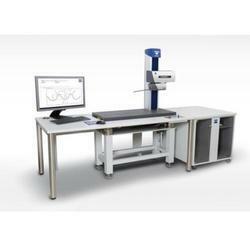 The form measuring station features excellent rotational accuracy and a substantial measuring range in spite of its compact design. 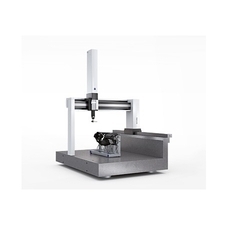 Heavy workpieces also pose no problem for this precise spindle form tester. Comprehensive collision protection, fully automated alignment of the workpiece and automated CNC measuring runs set the RONDCOM 73 A apart. The ACCTee PRO software included offers an intuitive user interface and guides the user through the entire measuring process. * Higher throughput thanks to automated alignment and CNC runs* Excellent rotational accuracy with a large measuring range* Collision protection in all directions* Ideal for heavy workpieces* Safety device and automatic weight counterbalance of the R axis* Automatic measurement of different diameters without manually moving the sensor* Intuitive operation with ACCTee Pro* Granite construction ensures long-term stabilityThe RONDCOM 73 A is very flexible thanks to extensive accessories and fixture designs tailored to the customer's needs. The RONDCOM 73 A is ideal for measuring jobs such as cylinder heads, engine blocks, crankshafts and cam shafts, and for highly accurate measurements on heavy workpieces. 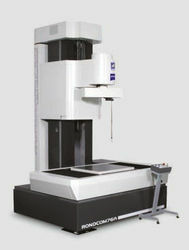 Large ZEISS Coordinate Measuring MachinesIn the aerospace industry, in vehicle and mechanical engineering as well as in many other fields, coordinate measuring machines with a large measuring range are required so that there is no need to compromise when it comes to precision.This is why ZEISS offers a wide range of tabletop, bridge-type and gantry coordinate measuring machines in various sizes. Select the appropriate optical or contact sensors. Together with ZEISS CALYPSO metrology software, you have a future-proof combination tailored to your needs. 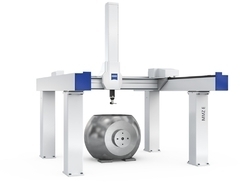 With a measuring range of up to 14.8 m, the ZEISS MMZ T offers the largest measuring range from amongst the table bridge-type measuring machines. For example: it enables the highly precise measurement of large gears directly on the shop floor. Reliably measure at the push of a button:Thanks to fully automatic setting of both illumination and focus, measuring errors due to operator influence are eliminated. 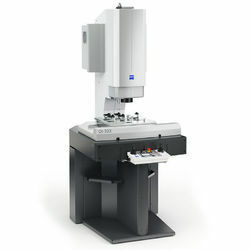 At the mere push of a button, ZEISS O-SELECT evaluates the characteristics and documents the results – also in a professional report if needed.The intelligent ZEISS O-SELECT digital measuring projector:In production environments, optical and contact coordinate measuring machines are increasingly replacing manual equipment such as goniometers, gauges and profile projectors. However, the influence of the operator with these manual tools must not be disregarded. With O-SELECT, ZEISS is reducing this influence to a minimum. Thanks to its high level of automation and ease of use, complex measurements can be completed quickly, traceably and reproducibly. Serial measurement at the press of a button:Parts for which a measuring plan has already been generated can be tested with ZEISS O-SELECT at the press of a button. 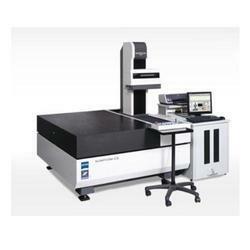 The system identifies the positioned part and loads the appropriate program automatically. The alignment is also automatic. ZEISS O-SELECT sets the optimal illumination and focuses automatically. This not only lightens the operator's workload, but also makes the measurement operator-independent and reproducible. If required, the reliable result is automatically output or printed in a report. Fields of application:Whether it is used in the automotive, electronics or plastics processing industries, ZEISS O-SELECT provides precisely the simplicity and reliability needed in today's industrial environment. The digital measuring projector is particularly suitable for checking the dimensional accuracy of distances, radii or angles. Common test parts include punched and bending parts, or injection-molded and laser-cut workpieces.Automatically focused:Incorrect focusing may lead to measuring errors of several micrometers. In manual focusing an error is easily made, unnoticed by the operator. To eliminate this source of error, ZEISS O-SELECT automatically identifies the characteristics to be tested and sets the focal plane accordingly. In other words, operator errors are eliminated. Automatically the best light:Optical measurement can only succeed if the illumination is right. To ensure that each characteristic is seen in the best possible light, ZEISS O-SELECT offers a variable illumination system. The illumination is set automatically to each characteristic, ruling out any possibility of operator error.ZEISS NEO select software:The ZEISS NEO select combines ZEISS metrology know-how with innovative, simple operation. Serial measurements are performed at the press of the button – regardless of the operator. Single measurements and measurement plans are no problem with ZEISS NEO select software: because it is so easy to understand, offers clear operator guidance and reduces his or her workload. Measure directly in the image:Functions and information currently needed are just a mouse click away. Only what is actually required is displayed. – That is the basic idea behind ZEISS NEO select Software. For most measurements, you will never have to leave the main window. Instead of navigating through sub-menus, you measure directly in the image. The clear graphic and logical structure of the software enhances the simplicity of operation. And: the content of individual windows can be defined on an individual basis.Single measurements with Click & Pick:Even unknown parts for which no measurement plan has been generated can be measured quickly, easily and reliably with ZEISS O-SELECT. Using an automatically high-contrast and focused image, ZEISS NEO select software identifies possible features like circles and straight lines. Flush-floor access:With the flush-floor model, ZEISS CARMET offers free access from all sides. An onfloor version is available for use with an existing foundation. 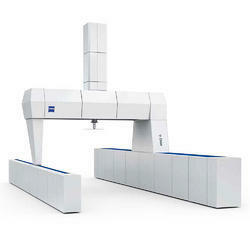 Precision and dynamics:The ZEISS CARMET Z column has a trapezoidal shape. A wide base providesstability and rigidity for maximum precision. The upward taper saves on weight, which benefits the dynamics. In this way ZEISS CARMET combines precision and dynamics in a superior design. Linear guideways with ball chains:Linear guideways with ball chains ZEISS sets in all axes linear guides withball chains, which are characterized by high rigidity, smooth operation and lowmaintenance. Integrated control:ZEISS CARMET is controlled by a moving control unit integrated in the measuring machine. This reduces the number of interfaces, speeds up the installation process, and reduces space requirements. The control unit housing also serves as a holder for the control panel. Safety:The horizontal arm of the ZEISS CARMET is equipped with space-saving collision protection on both sides to protect people and material from injury and damage. The proven friction drives in the ZEISS machines that simply slip through when there is a blockage also contribute to safety. Temperature stability:For all structurally relevant components, ZEISS consistently uses steel, which allows for even, controlled heat expansion. In addition, the Z column is also thermally insulated by F.I. technology. The result: The machine can be used in a broad temperature range from 16 to 24°C within the specified measuring error. Furthermore, the machine does not have to be cooled, and temperature compensation is not required. In addition, the light insulation cover can be removed quickly and easily for maintenance. RONDCOM 43 is an exact, compact form tester featuring a precise rotary table on air bearings. The low rotational error of 0.02 µm is unrivaled in this price class. Operation is simple and user-friendly through fast, automatic part alignment and measurement. The ACCTee PRO analysis software can be preset to the user's preferences. In the EASY mode the user is guided completely and step by step through the measurement. ACCTee Pro allows time savings of up to 40 percent in the part analysis. Changes to the filter and analysis settings are immediately visible without any repeated measurement. 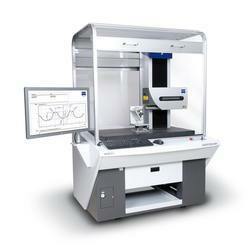 Are you looking for a compact table-top form tester? Take advantage of the benefits of RONDCOM 43 for the analysis of roundness, cylinder form, perpendicularity, parallelism, straightness, flatness, coaxiality, concentricity, thickness error and radial runout. With rotational error of just 20 nanometers, RONDCOM 43 is ideal for a wide range of precision parts that have a maximum diameter of 400 mm and weigh less than 25 kg. Carl Zeiss RDS-C5 articulating probe holder with our XDT multi-point sensor or Renishaw TP20 touch-trigger. Measure angled features in difficult to reach locations. The articulating probe holder offers +/- 180 degrees of bi-directional rotation and permits indexing steps of 5 degrees reaching 5,184 angular positions for either sensor.SPECTRUM can also be configured with the XDT directly for general prismatic applications.CAA (Computer Aided Accuracy) ensures computer-aided error correction of the dynamic deformations of the machine technology. 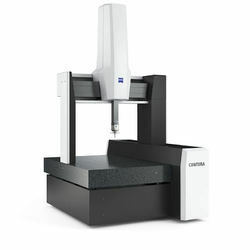 The granite machine table underscores the sturdy construction of this measuring machine.4-side air bearings from Carl Zeiss ensure more stability and measuring precision.The controller, software, sensors and additional components are ZEISS products and are optimally matched to each other.The computer-independent standard control panel permits manual control via the joystick at a measuring location away from the computer. Speed during CNC operation is controlled via the overdrive knob. 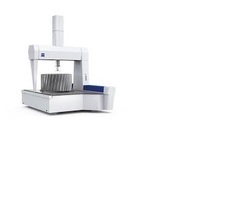 The platform design o	f the ZEISS ACCURA allows you to configure the measuring machine to meet your needs. If your equipment, sensor and software requirements grow, the ZEISS ACCURA adapts. Measuring accuracy into the cornersEvery size of the ZEISS ACCURA comes with a maximized measuring range. This guarantees measuring accuracy into the corners. Temperature range of 20ºC to 26ºCThe ZEISS ACCURA bridge is covered with Foam Insulating Technology, a new type of high-performance insulation. The housing covers ensure maximum insulation and minimal thickness. This enables the operator to select a measuring lab temperature between 20ºC and 26ºC. Low weight, high dynamicsMade of steel and aluminum, the ZEISS ACCURA bridge is extremely rigid, yet slim. The aluminum elements are coated with CARAT technology from ZEISS to improve temperature stability and service life. The reduced weight of the moving parts improves the dynamic rigidity of the machine. FutureproofThanks to its modular design, ZEISS ACCURA is ready to meet the demands of the future. It grows with your requirements on equipment, sensors and software. VAST navigatorZEISS ACCURA comes standard with VAST navigator technology to enable even faster calibration, approach and scanning, as well as improved precision. Maintenance-friendly designAll housing panels of the bridge can be removed and remounted in only a few steps. This reduces the time needed for maintenance and increases machine availability. Optional High-dynamic PackageThe High-dynamic Package turns ZEISS ACCURA into a high-speed measuring machine. It permits travel speed of up to 800 mm/s. Due to the high speed, the measuring area of the machine requires added protection. Laser scanners monitor the protection zone around the machine. If anyone enters the safety zone, ZEISS ACCURA immediately slows down. High-speed measuring operations are automatically restarted once the zone is cleared. This safety technology is included with the High-dynamic Package. 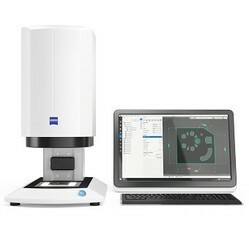 Perform easy measurements with ZEISS METROTOM: Measuring and inspecting complete components:The ZEISS METROTOM is an industrial computer tomograph for measuring and inspecting complete components made of plastic or light metal. With traditional measuring technology, hidden structures can only be inspected after the time-consuming process of destroying the component layer-by-layer. Measure a lot of characteristics easily and precisely:With ZEISS METROTOM computed tomography system, numerous component characteristics are scanned in one run. The resulting measurements are precise and traceable. Unlike contact measuring methods, ZEISS METROTOM is significantly faster when capturing numerous measuring points. Intuitive handling with easy machine software:Following a short training course on how to use the ZEISS METROTOM OS machine software, the operator is able to tomograph components and look into the interior of the component. With ZEISS CALYPSO you can evaluate the CT data and with ZEISS PiWeb, they can be merged quickly in a single measurement report. * Obtain 3D data on entire intact electronic components, large raw materials samples, or biological specimens. * Perform non-destructive failure analysis to identify internal defects without cutting your sample or workpiece. * Characterize and quantify performance-defining heterogeneities in your materials, like porosity, cracks, inclusions, defects, or multiple phases. * Perform 4D evolutionary studies, through ex situ treatment or in situ sample manipulation. * Connect to the ZEISS correlative microscopy environment and perform nondestructive 3D imaging to identify regions of interest for subsequent high resolution 2D or 3D electron microscopy imaging. 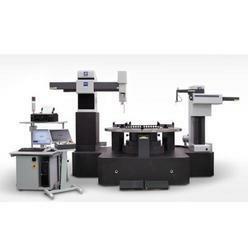 The flagship for contour and surface measuring technology from ZEISS features high resolution and a laser-interferometric measuring system. SURFCOM CREST is often used in calibration labs. SURFCOM CREST:Precise, universal, dynamic – SURFCOM CREST is setting new standards in accuracy and speed. 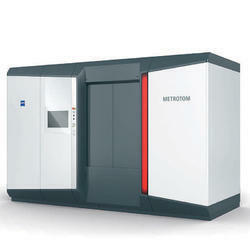 The machine measures surface parameters and contours in one measuring run and impresses with its extremely good ratio between the measuring range and the resolution of 42,000,000:1.This enables the SURFCOM CREST to measure the slightest surface roughness and contours across a very large range – all within a single measuring run. The SURFCOM CREST works in the Z axis using a laser interferometer as a measuring system, making it extremely precise. 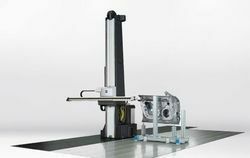 The measuring station features a linear drive, ensuring that it is significantly faster and with lower vibrations than measuring machines with traditional spindle drives. The swiveling linear X tracing driver also enables greater flexibility with slanted workpieces. Designed for quality assurance in volume production, the SURFCOM C5 is ideal for performing the fully automated surface measurement of engine components. SURFCOM C5The SURFCOM C5 was developed for fully automated surface measurements and quality assurance and is ideal for working with engine components and waves.The fully automated surface measurements are quick and reliable. In addition to the CNC axes in the X Y and Z directions, the SURFCOM C5 features a cross feeder and a tilt axis for the sensor, enabling it to measure in all directions without any problem. The open system design is dominated by the large granite measuring table which is perfectly suited for connecting component-specific fixtures. The SURFCOM C5 enables very high throughput. Large parts such as crankcases and cylinder heads can be measured in next to no time thanks to the high positioning speed of 100 mm/s. The tracing driver in the X direction is equipped with a vibration-free, low-maintenance and extremely precise linear drive, ensuring stability.